Suggested readings on Pruning Roots, Branches and Sprouts as well as other Tree System Treatments of Value (TOP QUALITY) - TREE PRUNING "WORLD WIDE PHOTO GUIDE" by Dr. Alex L. Shigo. Pruning is just one treatment. Treatment of the tree system is very important. I suggest MODERN ARBORICULTURE by Dr. Alex L. Shigo as a guide. When your tree is wounded, you should not treat only the wound but the entire tree. When in doubt about a tree treatment, go slowly and lightly. This is not intended to be the last word on the topic of pruning. Pruning is a four part process; how to cut, which to cut, when to cut, and how much to cut. Wind, lightning, and fire commonly injure trees. To these can be added other natural agents such as birds, insects, and animals. And finally, there are people. You may have heard that trees "like to be pruned." 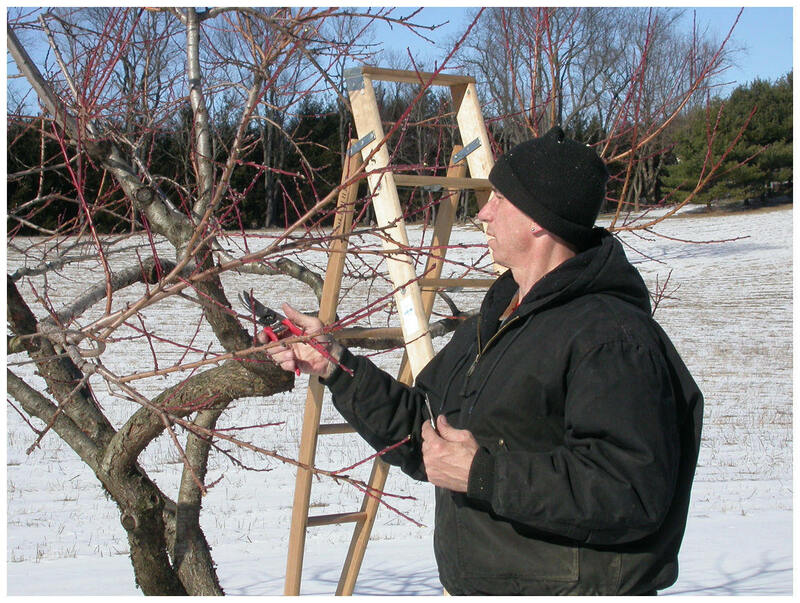 Pruning can improve the quantity and quality of fruit and nuts as well as board-footage. And like a haircut, pruning can improve the appearance of a tree. But it is important to distinguish between what is in the interest of the tree and what pleases humans. Pruning is a trauma to a tree, and a tree will treat a pruning wound as it does any other injury. Trees actually "prune" themselves in some circumstances. When lower branches become shaded and cannot produce the energy needed to survive, they are sealed off and shed to the soil. Trees have adapted an elaborate internal system of connecting branches to the wood of the trunk that supports the branch but can seal it off when its time has come. Within this junction, called the branch collar, there is an interlocking "switching system" of vessels that supplies these functions. Visually recognizing the branch collar is of critical importance to the tree pruning person. If pruned at the right spot, the collar will be able to seal off the wound quickly. But if the collar itself is damaged, the process will be impaired, and the collar will become infected and add to the stress that the tree is trying to overcome. Because the vessels split in two at the collar, cutting too close to the trunk cuts into the mainline vessel as well as the branched portion. I would like to discuss DOSE, TIMING and TARGETS for pruning of most woody plants. Targets may vary depending upon the objective. 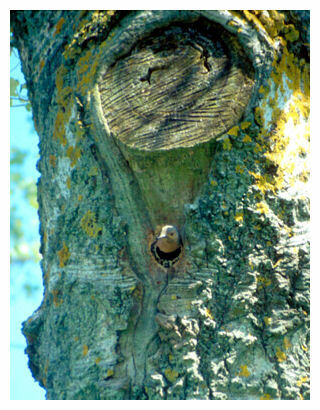 E.g., a flush cut would not be desired for the health of a tree, however, a flush cut in certain circumstances, may be desired for creating a home for small wildlife (a cavity for tree associates). Picture at left shows a bird at base of a flush cut. My goal of this guide is to present results of scientific research on pruning in a way that can be understood easily by all people who care about trees. A major problem throughout the history of tree pruning has been the scant attention given to pruning as it affects the desires of man. I would like to discuss pruning for the desires of man, but also for the health of the trees and their associates. When a few simple concepts on tree growth are understood, proper pruning becomes simple and a matter of common sense. I will try to make this guide easy to read, and easy to understand, and easy to put into practice. This is not intended to be a rule book full of absolutes. Themes are presented. There will always be variations on the themes. We must use great great care and caution when pruning. For help and advice on pruning, consult tree care professionals- arborists. Click here for suggestions in finding such a professional. Why to prune (And Things To Consider)`. Branches Defined - The degree of management of any system is directly proportional to the degree of understanding of the system. (Shigo 1999) Before we learn how to take branches off of trees, an understanding of how braches are attached to trees would help. Differences between a woody stem and a woody root. If trees died when mistreated, there would not be many trees around. Modern trees have multiple growing points in the form of branches, lots of lignin in cell walls, and seeds. History Of Pruning - It was once thought, if the tree did not die immediately, the treatment must have been successful. Arboriculture was founded on three treatments: flush cuts, paint, dig out cavities. All were injurious to trees. Pruning Branches and Such - Proper and Improper - Make pruning cuts as close as possible to the branch collars and without leaving a stub..
Pruning Sprouts / Sprouts Defined - Sprouts form when fuel reserves get low in trees. When energy reserves decrease, meristematic points form sprouts. Root sprouts come from meristematic points in roots. Roots do not have buds or branch collars. Pollarding - Tree mutilation is often called pollarding. Proper pollarding is a fine tree practice. Topping is not pollarding. Proper pollarding starts with proper training cuts. Know the tree design you want before you start. Start with a tree species that lends itself to that design. Proper pollarding requires constant attention. Care must be taken not to cut into the pollard head or rot will develop into the trunk. The same precautions must be taken for grapevines, wisterias, and other plants that are pollarded. Topping - It was once believed that if you want a large root system compared to the crown, top the tree. A false statement. The symplast of woody roots require energy from the crown (photosynthate) for defense. We believe when energy in the symplast of woody roots is low, woody root decay causing fungi advance. Flush Cuts History - Where trees were pruned, branches were often flush cut to the joining stem. This pruning, one of the most injurious treatments that can be inflicted on trees, became common practice. Predisposition agents and conditions, such as flush cuts, slowly destroy defense systems. Arboriculture was founded on three treatments: flush cuts, paint, dig out cavities. All were injurious to trees. More on "Flush Cuts"!! Removing symplastless or so-called "dead branches". Give a tree a shower. Cut away the symplastless branches. See page 47 of "Journey To The Center Of A Tree" on pruning. Cladoptosis is branch shedding, and not related to bad breath. Cracks - [This section is work in progress] Many branches that fracture often fracture after the second or third loading. The first loading sets the cracks and-the second or third loading causes the final fracture. Cracks that start from the outer bark inward are usually very shallow. Large internal cracks start from weakened spots such as wounds, branch stubs, dead spots between co-dominant stems or roots, and insect wounds. Dose - young tree verses maturing tree. How Much? There are limits to every system. Wound Dressing - Trees seal, not heal, wounds. There are no data to show that wound dressings prevent or stall decay. Wetwood And Branches - Wet spaghetti bends. So long as wetwood lubricates branch cracks, the branches bend. When the wetwood fluids dry, the branch could break. Trees continue to support the soil associates by supplying a rich source of carbon and other essential elements as they drop leaves, twigs, branches, and finally give their trunks and woody roots. Branch Protection Zones - Boundaries at the base of branches internally. Longevity of trees is strongly related to the resisting force of the protection zone that forms at the branch base after the symplast of the branch dies. Long living trees, such as white oaks and redwoods, have strong branch protection zones. Gray birch and cherry have very weak branch protection zones. High Risk Of Hazard Trees - Listed here are many examples of high risk of hazard conditions which pruning has the potential or capacity to reduce. Trees Associates - Animals and such. Pruning Stump Sprouts - Growing healthy trees from stump sprouts. Thinning Out The Crown - A treatment of the past. Pruning "Neglected" Trees - Too often trees are planted in the urban environment and the are tortured by means of neglect. A professional knows .... dose (how much), timing (when), and the limits of the tree system. it's not an easy task. Help and benefits from the system can come by understanding dose, timing, and the limits of the system. Dose, not only meaning what we add, but what we remove (pruning) from the system. Timing can be treat or harvest. Limits mean the point in dose and timing where additional actions will cause the system to go from order to disorder. Limits mean we can add or take only so much, and we can only repeat this so often. When we exceed the limits of the system, it will not return to its original state. Dose = See "A Professional Understand Dose" As trees age, treatments should change, especially dose of fertilizers and pruning. Click here for a diagram. Timing = When to prune When flush pruning was considered correct, timing of pruning was extremely important because the cuts caused serious trunk injuries that removed the branch protection zone. When collar cuts are made, timing is not so important. Small mistakes that injure the collar or trunk during leaf flushing and leaf shedding can still cause injuries. Repetition = how many times or how often. E.g., a pollard must be pruned every year where as the goal of natural directional pruning near power lines is designed to make the time between pruning as long as possible. A professional understands the latter. Utilities - Pruning Trees Near Utility Lines. CAUTION! This practice is better left to professionals! For older trees near utility lines, the 90-3-90 guide can be used. It states that 90 percent of the time, the removal of three branches will give 90 percent of the required clearance . Directional pruning is different from 90-3-90. Too often in directional pruning, branches growing toward the lines are tipped. In 90-3-90 the entire branch growing toward the line should be removed. Tree roots grow from meristematic points and do not have branch collars, buds or a pith. Just as branches die and leave stubs that are openings into the trunk, roots also die and leave root stubs. Microorganisms do not have to "look hard " for ways to get into trees. Roots grow from meristematic points and do not have branch collars. When a woody root is pruned, it is best to prune the woody root straight across (like the end of a straw) with a sharp tool. When this is done, a ring of callus will form at the tip. This ring is meristematic and new roots will grow in new spatial positions from the callus. When the tips of woody roots are crushed and not cleanly cut, decay will prevail. Click her for more on pruning woody roots. Here is a picture of a root collar. It appears to be attached the opposite way than a branch. It would be nice to prune woody roots correctly prior transplanting. Trees are often wounded by agents other than humans. Many trees in south Florida were injured severely by hurricane Andrew several years ago. After storm injury, work must be done first to reduce the risk of fractures that could cause problems for property and people. Leaving stubs would be acceptable as long as a scheduled treatment for making final correct cuts is made. Next, the trees should be pruned for health. 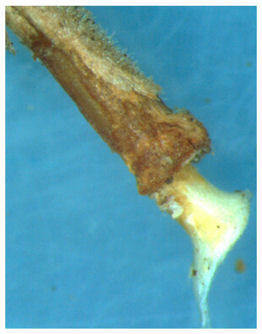 This means cutting off torn roots and removing long, injured branches to avoid sprouting that could lead to fractures. Trees do not move from place to place, but they move or sway constantly in place. The swaying can cause injured branches to weaken to the point of fracture. Small branches falling on people can cause serious problems. We look most of the time for overwhelming potential defects while the smaller defects are frequently overlooked.